A few years back, the main choice in backup was to do it all on-premises, with backup to disk and perhaps to an additional tape drive. Larger shops often also had a third tier, sending additional media off-site for archiving, or used optical disks in-house for that archiving. The cloud has changed all that, and now you can back up fast and secure to the hybrid cloud backup. That is a leap forward compared to tape, which has a horrendous failure rate. Research done by Gartner shows that backups in an average data center only worked some 85% of the time. Remote offices are worse, with a success rate of only 75%. Adding insult to injury, you often don’t know you have a bad backup until you try to restore from it. With a good provider, cloud backups are far more reliable. Yet you are still dependent upon a single provider, and that your Internet connection is up. Even if that connection is good, it can take a long time to restore from the cloud with many backup technologies. Most shops have a good disk backup system in place to do the first tier of backup. The real problem is generally with backup tape, which is hard to manage and fails far too often. The new approach has two names that mean the same thing – disk-to-disk-to-cloud (D2D2C) or hybrid cloud backup. 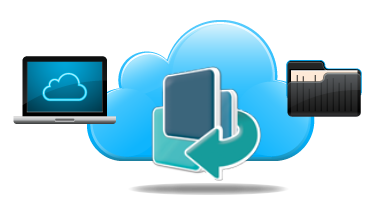 Here you maintain your initial disk backup, which is still done in-house, but have the second backup tier in the cloud – which can replace tape. While you are still maintaining the first tier of backup infrastructure, the cloud tier is handled for you. And this tier can scale without having to buy more disk, software licenses, and manage the whole thing. Hybrid cloud backup truly blends the best of both worlds. The cloud tier is scalable, easy to manage, and essentially guaranteed to restore properly – offering true disaster recovery. And restoring from the cloud is perfect for remote offices that aren’t near the local disk backup. Meanwhile your local disk backup remains intact. Being local, this can be far faster to restore from. BluPointe solves the problem of slow restores from the cloud with its Deep De duplication feature which only saves changed blocks during backup, not the entire volume. This means you can restore, in many cases, just these changed blocks, dramatically speeding restoration. Gartner goes further, advising IT to investigate new backup tools, and be willing to buy from non-traditional storage vendors. Things to look for in a cloud backup vendor include solid support for hybrid cloud backup and high-level de duplication, Gartner advises.